Hyderabad, Feb 15: Senior actors Balakrishna and Nagarjuna have won the Best Actor Awards at the prestigious TSR-TV9 National Film Awards for 2017-19. The films Gauthamiputra Satakarni and Mahanati won most awards while the Sridevi Memorial Award went to Vidya Balan. The function will be held at Visakhaptnam on Sunday. The awards for 2017 and 2018 were announced on Thursday by TSR Lalitha Kala Parishath chairman T. Subbarami Reddy. The awards function will be held at the Visakhapatnam Port Stadium on Sunday from 5 pm onwards. Reddy said this was the second time that he was going to conduct the film event in open grounds. "Many South Indian stars and Hindi stars are going to attend this function. Chiranjeevi is attending as a special guest," Reddy said. Balakrishna and Nagarjuna were adjudged best actors for 2017 and 2018, respectively, for their films 'Gauthamiputra Sathakarni' and 'Devdas'. In the female category, Rakul Preet Singh and Keerthy Suresh got the Best Actress award for their films 'Rarandoi Veduka Chooddam' and 'Mahanati' respectively. Ram Charan gets the Best Hero award for his outstanding performance in the film 'Rangasthalam'. In the Best Directors category, Radhakrishna Jagarlamudi (Krish) and Nag Ashwin won for the films 'Gautamiputra Satakarni' and 'Mahanati' respectively. Both these films also won Best Films award for the respective years. Chiranjeevi’s 'Khaidi No. 150' won the Most Popular Film award for 2017. The film’s director, V.V. Vinayak, won the Most Popular Director award. Interestingly, Chiranjeevi’s son Ram Charan-starrer 'Rangasthalam' is the Most Popular Film for 2018 and its director Sukumar Most Popular Director. 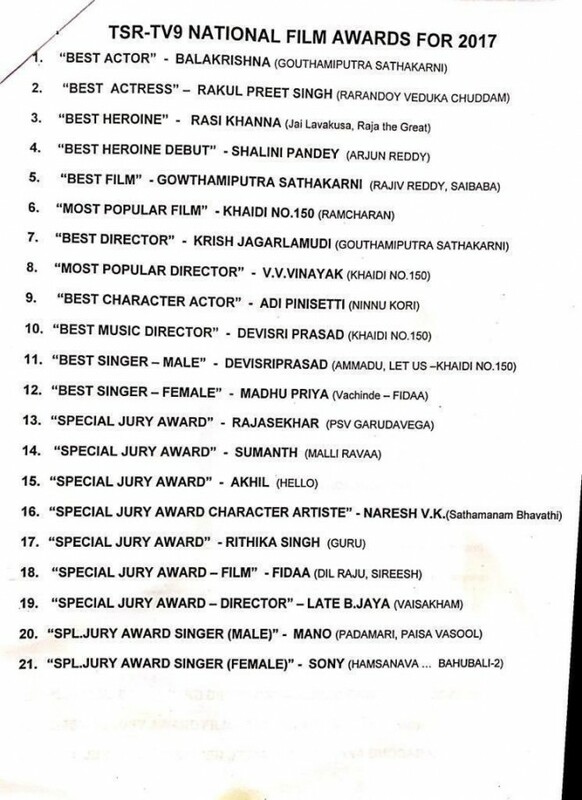 Actors Rajasekhar, Sumanth, Akhil, Naga Chaitanya, Supriya, Kalyan Ram and Bellamkonda Sai Srinivas got Special Jury Awards for their performance in their respective films. There are many other awards, for singers, music directors and technicians.